Victor Mace is a freelance agent with the CIA. His father, an American named Victor George Mace, had been assigned to the People's Republic of China during the Korean War where he met and married a Chinese lady named Su Li Nai. After the conflict, he moved to Hong Kong with his wife and their newborn son, Victor Mace, jr. 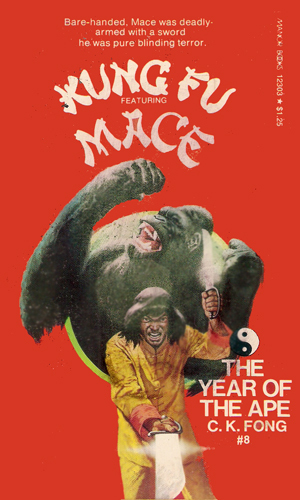 The elder Mace was killed while helping refugees escape from Red China. Two years later, young Mace's mother remarried. The stepfather sent the boy to a Shao Lin temple to learn the martial arts. 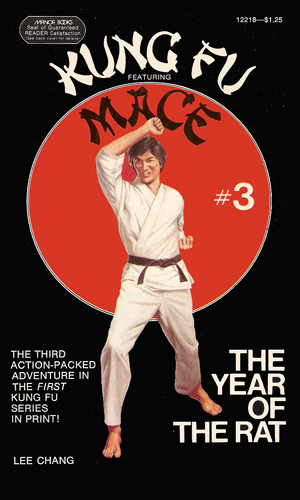 As the series opens, Victor Mace is in his mid-20's and is an expert in multiple forms of combat including kung fu, karate, and the silent arts of the ninja, all taught him by his beloved Master En Sheng. Though he called Hong Kong his home at that time, he had moved to the US to visit his younger half-brother. Eventually he would move to New York and take up teaching, at least part time, at a kung fu academy there. Mace is decidedly Eurasian, having some facial features of his Caucasian father and standing 6'2". Still there is a majority of his mother in him and he considers himself principally a Chinese. He has no love, however, of the dictatorial regime of his homeland both because of the death of his father and because their tactics fly against the teachings of his Master. It is not until the third book in the series that Mace becomes involved in the world of espionage but the actions of the first book brought an invitation to the dangers of the second book, and it was that conflagration that led to his being noticed by the Agency. When they needed someone of Chinese descent for a dangerous mission and he readily agreed. He doesn't work full-time for the CIA but takes the occasional assignment, making his new home in New York when not on a mission. The San Francisco Mafia wanted Ho Li Wing to use his legitimate boating business in their smuggling operations and were willing to kill to make it happen. Visiting Wing was his nephew, Mace, who didn't appreciate their tactics. 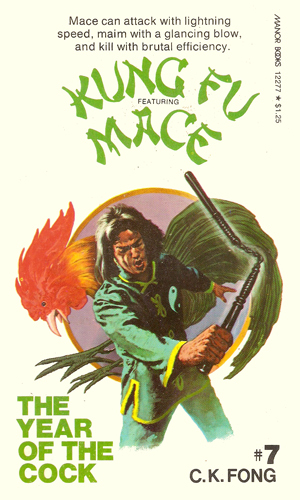 Having heard of his work on the West Coast, a New York tong asks Mace to come help with a growing Chinese gangland reign of terror but Mace learns that the power rose far higher than street thugs. The Red Chinese have created a secret lab in Canada, preparing to unleash a virus across the US and lay the blame on Russia. The CIA know they need someone who can fight them on their own terms and they call upon Mace to be their man. A very valuable Ming statue was to be a part of a cultural exchange between the US and the PRC but it has disappeared. 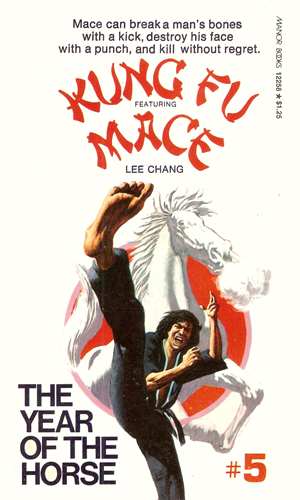 Both the Chinese secret police and the CIA appeal to Mace to track down the culprits and retrieve the artifact. The mob in Chicago was making a foray in the Chinese community and bringing guns and violence with them. Victor Mace is asked to lend a hand. Before he could decide, a friend of his is kidnapped and sold into slavery in Mexico. Mace now has vengeance on his agenda. Mace is back in New York, teaching at the Lotus Academy and enjoying life when an old enemy, a fellow student from two decades before, comes into the picture and decides to end the old feud the violent way. The Red Chinese are in Houston to carry out a plot to destroy oil facilities, bringing economic ruin to the US. Mace is called in by the station chief there to help stop them. 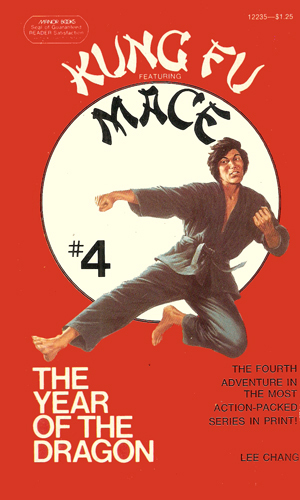 A sighting of an old adversary from the Red Chinese in Denver has the CIA asking Mace to travel there to find out what that spy was up to. The death of a friend and fellow adversary of the spy makes Mace certain that trouble is brewing in the Rockies. 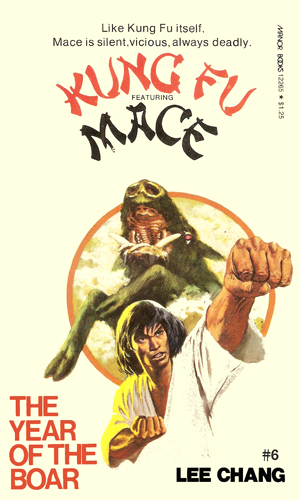 I decided not to count the number of times that Mace, preparing to fly into combat, screamed "Ki-ai" to harnass his energy and to alarm his opponents. That was probably a good thing, too, because the number would have been high. Very high. 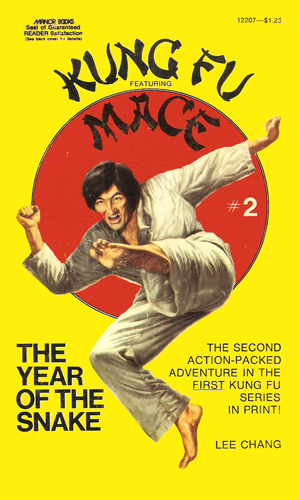 For several years I had this series down in my library database as Action. It was only when re-re-reviewing that decision that I came to the conclusion that since more adventures were for or with the CIA than were not that the series belonged in this listing. My grade clearly shows that it is not a high-ranking member but it still belongs. The missions are simplistic in the extreme. Mace's job seems to be a very easy one, except for the constant fighting, because his enemies always come right after him. He arrives at an airport, someone spots him, and before you can say "Ki-ai" he is flying through the air to beat up the baddies. And then they keep coming. Not once does an opponent think, "hey, he's tough. Let's lay low for a while." Nope, they stay and fight! And fight more! And Mace keeps on winning! By the way, even more prevalent than "ki-ai" is the use of the exclamation mark. When Mace kicks or yells or jabs or punches, he means it!!! The series was originally written by Joseph Rosenberger. Whether Mr. Rosenberger was really the creator is not certain, though I have credited him as such. He wrote the first five books of the series. The sixth was written by Leonard Levinson using the same house name. 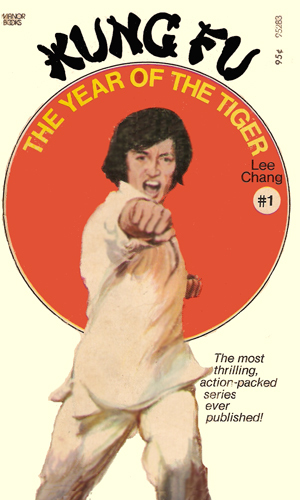 The last two were written by Bruce Cassidy using the pseudonym of C.K.Fong.